Villa Josefa is a great choice for a relaxing villa holiday. You'll be close to the shops and restaurants in the centre of Cala Galdana, and keen beach goers will love the stunning sandy bay, all reachable within a short walk or drive. 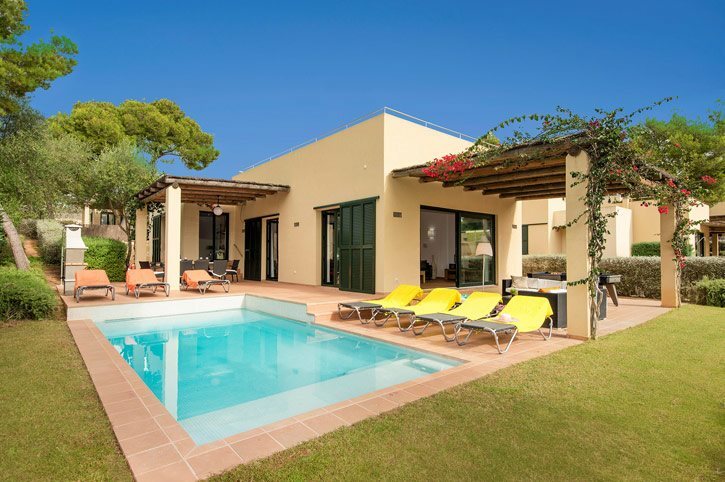 The villa itself is spacious and contemporary in design, with 4 en suite bedrooms and a private swimming pool. WiFi, pool heating and air conditioning/heating in the bedrooms and lounge are included. A contemporary villa in a great location. The nearby beach at Cala Galdana is one of the best on the island - a great choice! Outside, the private pool is surrounded by ample space to relax and enjoy the sun. When you need a break from the heat, pergolas at 2 sides of the house provide welcome shade over the comfy 'chill-out' area and dining table and chairs. You also have your own BBQ, ideal for cooking up a traditional Spanish meal for your party to come together and dine alfresco. Villa Josefa has a private driveway for your hire cars, with steps up to the main entrance. The large lounge and dining area are open plan. There is a comfortable seating area, flat screen TV, as well as a dining table and chairs, and with large glass sliding doors opening onto the pool terrace. The fully equipped kitchen is adjacent, up a couple of steps, and has a second small table and patio door onto the terrace. Level with the kitchen are 2 twin bedrooms. The third twin bedroom is on the lower floor. The double bedroom commands the entire first floor and has a dressing area and private terrace with views over the resort. All 4 bedrooms have an en suite shower room and there is also a WC by the entrance. Tourist Licence Registration: VT 712 ME. Villa Josefa is in a great position. The centre of Cala Galdana's has a variety of shops and restaurants, all within a short walk or drive downhill. The resort is also home to one of the best beaches on the island. The huge, circular bay has white sand and clear, shallow water making it a popular choice with both locals and visitors alike. Large group? Villas Julietta, Marita and Marco are along the same street. In the centre of the resort you'll find a good choice of shops, bars, cafes and restaurants. Wander along the riverbank and cross the bridge to reach the restaurant on the edge of the beach. The centre of the resort is downhill from the villa and can be accessed either on foot, or within a couple of minutes' drive. There is plenty of parking space for your hire car. If a lazy day relaxing on the beach is more your scene, Cala Galdana is home to one of the largest and most spectacular bays on the island. Keen walkers can also visit the neighbouring, more remote beach of Cala Mitjana in around 40 minutes along the coast. The main road into Cala Galdana has 2 spectacular horse shows where you can enjoy a bit of true Spanish atmosphere. The island also has a choice of waterparks, mini-golf facilities, water sports and go-karting all easily reached by car. A trip to the viewpoint on the other side of the bay is a must! One of the most photographed spots on the island, from here you can enjoy the stunning panoramic views over the whole bay and open sea. For anyone who does hire a car, any of the resorts, towns and attractions on the island can be easily reached. A visit to either Ciutadella or Mahon, or an adventure up Menorca's highest point, Monte Toro, all make a great day trip! Menorca's only golf course is 35 minutes' drive away in the resort of Son Parc. Villa Josefa is not available to book for season as it is sold out. Take a look here at the Menorca villas that are currently on sale. A firm favourite with the kids, there are several, well kept courses around the island. Castillo Menorca, just outside of Ciutadella, has a great mini golf course as well as various pools, shops, childrens entertainment and a restaurant. All the courses have a cafe or restaurant adjacent where parents can relax and keep a watchful eye. The resorts of Santo Tomas, Cala Blanca and Cala Galdana all have mini golf facilities as well as Goody Goody Park in Calan Bosch. There are many horse and pony riding centres around the island as well as a choice of spectacular equestrian shows which have now become a regular haunt for many of the islands' visitors. The most popular horse show on the island is the Somni at the Son Martorellet Horse Farm, on the road from Ferreries to Cala Galdana. The farm is dedicated to the breeding, care and training of the Menorcan breed horse and puts on regular performances and dressage displays. Visitors will also be able to look around the farm and stables, and facilities include a gift shop, a choice of places to eat and a childrens play area. Or why not venture to Calan Blanes or Sant Luis which both still practise the 200 year old traditional of trotting races? The jockey sits on a cart pulled by a horse and tries to maintain the trot - place your bets on the race! Castillo Menorca, located on the main road between Ferreries and Cuitadella, has an adults pool with a water slide and a childrens pool, as well as mini golf, trampolines, a childrens play area, a shopping complex selling leather goods, jewellery, ceramics and gifts, a snack bar and a fantastic go-karting track! WiFi is also available. In addition to the above, several resorts also have water slides or splash pools, the largest being in Son Bou. Smaller slides for younger children can be found in Cala Galdana and Cala Blanca. The villa is in a lovely location and of a great size and specification. Excellent holiday - have been to this villa 3 times this year and have already booked another for 2017! First time we've used Villa Plus and we would definitely use again! The villa was amazing, great location and very smooth travelling with two children. Thank you so much. Villa josefa was very comfortable and the holiday was very enjoyable. Well equipped, good size villa - not too far from the beach and restaurants. Very quiet air con. Very spacious, clean and equipped with pretty much everything needed for a self catering holiday. This is the second time we have stayed in this villa this year and are already planning to stay there again next year, we love the villa and location. Our holiday was really fantastic and we would certainly recommend Villa Plus and our particular villa to others. The representative was helpful yet unobtrusive, the villa was spotless, spacious and beautifully presented. Thank you. Good location, close to beach, bars, supermarkets, lovely resort and perfect area for an extended family with small children. Very good value for money. Best accommodation I have ever had.